About Lockwood's Electric Motor Service, INC.
For more than 75 years, our in-house services have included the repair, replacement, or re-manufacturing of any part needed to keep our customer’s motor on-line. From forming new coils, repairing shafts, machining capabilities, resurfacing Commutators- whatever service it takes- we’re ready and able to provide it. Our on-site field services are equally comprehensive, including our capability to offer on-the-road dynamic balancing and alignment work. To provide full service, we have our own fleet of trucks available for pick up and delivery. Our “Round the Clock” emergency service and our distributorship of new parts and motors, as well as our one year guarantee on all of our services will make you see why Lockwood’s is your complete electric motor service. Lockwood’s capabilities cover the total range of electric motor services. Whether your needs involve a fractional horsepower, or a one of a kind fifteen ton motor, we can service or rebuild it quickly and effectively. If the motor can’t be serviced in your plant, we will take it to ours. In emergencies, our facilities and technicians are at your service twenty four hours a day, every day. A well stocked, modern facility, the best equipment, our own fleet of trucks, and highly qualified technicians all add up to make Lockwood’s your #1 Choice for handling all your needs with prompt quality and service. At Lockwood’s, our competitive edge with state-of-the-art equipment will assure fast delivery at a savings to you. 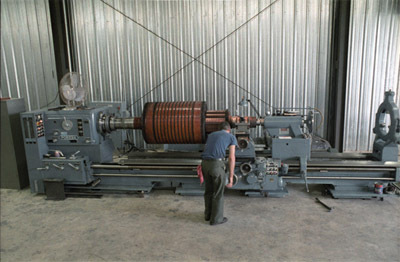 Our complete machine shop combined with a well equipped winding room. Two Polyester Resin Dip Tanks, a Vacuum Pressure Impregnation (VPI) system with five bake ovens, combined with Precision balancing Machines, Two 15 Ton Cranes, and the best available test equipment makes us the undisputed industry leader. But what makes us truly unique is our ability to design and build our own equipment. This gives Lockwood’s the capability to satisfy your most demanding requirements while saving you both time and money. With Lockwood’s ,you can be confident that we have the answer to all your motor servicing needs.